This Japan Gathering is another step after the Gathering in Jeju, Korea (March 2018). In Jeju, Japanese family have asked if the nations will covenant to walk with Japan and the nations responded with “YES!”. Then the Lord spoke to us that the Japan Gathering had to come after the Aswan Strategic Trip (September 2018) and the Egypt Gathering (October 2018). The Lord promised that in these two Gatherings, He would make the idols tremble, fall and break in His presence. We now feel the ground has been prepared for this Japan Gathering. All the families of the nations are invited to fulfill their promise to stand together spiritually and physically with our Japanese family. Registration Fee: There will be no set registration fee for this Gathering. Instead, we are each encouraged to seek the Lord, asking Him how much He would want us to sow into what He is doing in Japan at this time. Sowing can be done through the offerings collected at the Gathering or via credit-card online. Please register early as space is limited. Once the venue is full, we will not be able to receive more registrations. On-site registration will not be provided upon reaching full capacity through online registrations. Please note that children ages 5 and above need to be registered online. Please note that Kyoto does not have an airport. We recommend internationals fly in via Kansai International Airport (KIX) and travel to Kyoto via taxi, airport limousine bus, or by HARUKA airport express. Group van service may be arranged ahead of time. Please click the button below for more information on transportation. Registration desk opens at 5:00pm on Wednesday, March 27th. Please note that there will be paid parking spaces available at the venue, but it will be limited, hence public transportation is highly recommended. 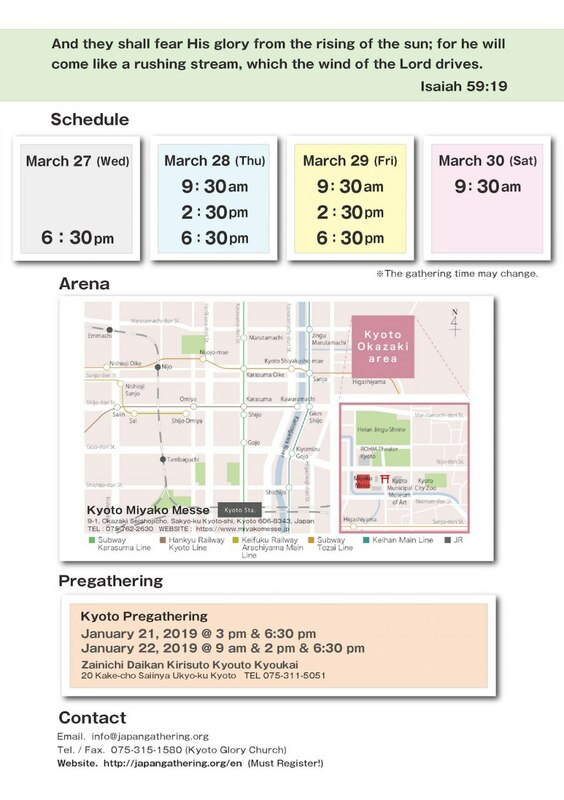 There are many ways to get to the Kyoto Miyako Messe. Please refer to this link: https://www.miyakomesse.jp/english/access/.